For those of you who have followed my writings since 2005 when I blogged on www.dotnetjunkies.net, then http://codebetter.com/jeffreypalermo/, and now on my own domain (although I still blog occasionally on CodeBetter), I wanted to give an update on my journey with the not-so-new company, Clear Measure, Inc. In June, 2016, we will be 3 1/2 years old, and we are around 50 employees right now. Here is a picture from our summer 2015 all-hands party on Lake Travis. We had a great time on the lake on the party boats as well as a couple of wave runners. It’s been a fun journey, and I absolutely love working with the people here. As I look back on the original vision and how we’ve grown so quickly, it’s interesting what went as planned and what has not. Mark Stavrou and I started operating on January 7, 2013 in a single office in Austin, TX using the Regus executive suites facility. This enabled us to have Class A office space from day 1. We knew this was important because our intended client profile was to be CIO’s and CEOs of high-tech or related companies. The original vision was to be a software management consulting firm. From extensive previous experience in doing consulting projects, from writing tons of code personally throughout my career, and from running a 30-person consulting company as a business executive, I thought this was a big need. At at the time, I had just finished earning my MBA degree from the Jack Welch Management Institute. I knew that quality software was much less expensive than low quality. Capers Jones really pushes that idea saying, “High-quality software is not expensive. High-quality software is faster and cheaper to build and maintain than low-quality software, from initial development all the way through total cost of ownership” in his Economics of Software Quality book. I knew that CIOs needed help managing their custom software differently than the company network, the various OTS products and technical support groups. Custom software is a completely different animal, and so many companies lose their shirt with it because the industry has not matured enough to create proven standards like other trades have. My vision fell completely flat. It turned out that there were CIOs and CEOs who needed help with their custom software. They needed consulting. There was a market, but that market was big enough for. . . me. I’m confident that the company could have grown to be as many as 5 consultants, but that wasn’t a compelling outcome. I’m a builder, and if I’m not continually building something, I’m lost. I struggled and struggled to find a way forward growing the company and training a workforce that could provide proper guidance to CIOs about managing their software. In fact, the original vision lasted only a month. During the second week of operating the company, we got our first client. It seemed like a fit. It was a well-established medical transcription company that has a software system that enabled their skilled transcriptionists to translate an audio recording of doctor dictation to an electronic record of the appointment fully integrated back into the hospital’s EMR system (electronic medical record). This integration occurs over the HL7 protocol, which looks a lot line a single line of an old COBOL batch file – fixed width protocol. With this client, we reported directly to the CTO and collaborated with the CEO. They didn’t have any technical staff to speak of because the CTO had written all the code long ago and was retiring. This was a small company, but a lot larger than we were, so we engaged. We helped with overall strategy and even analyzed financial options to get the best return on investment by opening up new revenue streams so that current customers could buy more. A big win was adding a doctor iPhone app to the system so that the doctor could speak the dictation directly into their iPhone and upload the recording by tapping a button. While this company certainly did need direction and strategy consulting, they also needed all the work done. They didn’t have any development staff. They didn’t have any support staff to monitor the system. The CTO had done all this. So, from this very first client, we were forced to diversify and expand from the narrow vision from when we started. We hired some contractors and got started. We essentially became their complete, outsourced, software engineering department. From that point on, we found a few small projects that were in alignment with our original vision, but that consulting revenue was hardly enough to sustain a company. It also was not scalable beyond my own capabilities. After the first year half year, we completely abandoned the original vision, and you don’t even see mention of it on our website. and engagements, but many were small contracts and did not yield a sticky and ongoing relationship. In March of 2013, we contracted with another company’s CEO. This CEO was running a legal services firm. They close out class action lawsuits. For one of the modules, we used some ComponentOne controls, and they even did a case study about it. This has been a longstanding client, and we’ve seen them grow from 5 employees to larger than we are now. They are with us to this day, and while we started by modernizing their old, insufficient, we have built them several more and are managing and supporting a full software suite that is critical in helping them execute their business model day to day. While we did work directly with the CEO on strategy, this was yet another total outsource customer. We were, and are, the entire, software engineering department. The only other technical people in the picture is a company that manages their office network as some servers in a local data center, on which the system runs. In May, we landed another, much larger client where we became the entire software engineering team for one of their product lines. While they had software engineers for other products, they had none for this product that hadn’t been aggressively updated. Then in July, we landed another significant client where we were the totally outsourced team. Along with lots of other smaller projects, it looked like we were in a market where companies wanted to get on with their business and rely on us for their custom software needs – both to build, to expand, and to run and support. At the beginning of 2014, we had 4 consistent customers that were all alike: we report directly to a C/VP-level executive, and we are the entire software engineering capability for them, both to build/change the software as well as to run and support it. We didn’t quite have a 24/7 capability yet, but we pushed through with my phone number itself being on the support list if something bad happened overnight – because our medical transcription client had overnight operations to get doctor transcriptions turned around by the next morning. At the beginning of 2014, we were expanding rapidly. We blew past $1M in revenue some time in our first year and never looked back, so that was an incredible blessing. 2014 was a year that seemed to validate our new vision, which was to become the complete software engineering department for our clients. We gained another of these clients in Q1 of 2014, and we were expanding rapidly. We hired 20 or so people in 2014 because of the expansion, and we were excited. The company had taken off rapidly. Our four total outsource customers from 2013 were still with us (and are still with us to this day), and we were convinced that this was our market. It turns out, we were mostly right, but not totally. We gained many more customers where we reported to a VP. We were excited about this as well, but they were a bit different. When there is no in-house software engineering capability, there is likely not a technical executive except for a CIO or CEO. With the clients were we aren’t in C-level conversations, that means there are other departments with software engineering capabilities. In this case, we did take on several clients (because who turns away a customer), and we made some stumbles. We had our approach of fielding a complete team according to the Fred Brook’s Surgical Team model, and we stubbed our toe a bit with that when applied to clients that already had a software engineering department. With our team structure, we asked business questions first. We wanted to make sure what we were doing would have a proper return on investment. We have kept that concept from the beginning. It’s even in our brand name: Clear Measure. We want to know that what we are doing makes a difference. Because at some point the CFO is going to look at a big number on a financial statement, and that number is going to have Clear Measure’s name written on it. I always want to have concrete value tied to that so that we never get in a situation where a client has wasted money on us. I never want a client to spend money on us. I want them to make money with us. Several of our new customer were past the business discussions, and the VP just wanted a crack team to knock something out. By this time, we already had a local reputation for having very high-end people. This was and is still true. Top talent is really hard to find and retain. We did some projects for these clients, but we found an off struggle, and we only were able to put our hands on it much later. By the way, these clients are no longer engaged with us, and we have analyzed where we weren’t able to quite make it fit. It came down to this: they didn’t really want to hire us. They didn’t. They had some really exciting projects to execute – some exciting software to build, but they didn’t want us. The needed us, but they didn’t want to need us. The problem was that their people couldn’t do it on their own. They needed help. So their plan was to us a “vendor” to help them through a spot until they could move forward on their own. If they had more recruiting ability or were able to build a sufficient department, they would be so much happier. But, they did need us, so they hired us. We did good work for them, but the projects ended. In these cases, we were expendable. We were a point in time solution to a problem they wished they didn’t have. We weren’t a business partner. We weren’t a core capability for them. We were an extension or an augmentation/support to a capability they had built internally and were intending to strengthen. To this day, we analyze the balance between a client’s structure and the likelihood that we can make ourselves indispensable so that they are so glad we work for them. While we were finding clients that would gladly hire us, we found a marked difference in the clients where we report to a technical VP or technical manager. In these cases, the internal manager wishes they didn’t need us, so it’s hard to build a long-term relationship that way. On the other had, we also gained more clients where we had relationships directly with the C-suite. We were able to have business conversations. We were able to analyze ROI, and the client could see that we were part of their ticket to revenue expansion and business success. These clients knew they were investing money, but they were happy they had found us. One of the clients that didn’t wish he needed us turned out to be very abusive. This was very unfortunate, and it was a huge wake-up call for me. I’d never experienced this before. I tend to be a problem solver, and I believe that all problems can be solved. I was wrong here, but it took 6 months too long to learn the lesson. We use that internally as an example of a client where we could not be successful. We could earn lots of revenue and probably hire more people, but ultimately fail. This was posted around social media recently, and I wholeheartedly agree. It starts with employees as the biggest asset. I’ve always believe that in this business. Most of our employees don’t need Clear Measure. They don’t need this job. They need “a” job, but they could get another job quite quickly. Clear Measure needs them. They make Clear Measure. Richard Branson has said “make your employees #1, and they will make your customer feel that they are.” I believe this progression. I, personally, don’t directly do the work for each of our clients day to day. Our people do. If they didn’t do this work, there would be no money coming in. It’s my job to equip, support, and elevate them so that they can do great work for the customer. In 2015, we stubbed our toe a bit with a customer that was not a good fit. That mistake will not be repeated. In addition, we also figured out the difference in the clients who had internal teams and the clients that didn’t. More importantly, we figured out that this was not that different at all. Rather, it was the client that wanted us and the client that hired us but wished they didn’t have to. This makes all the difference. Another client that was destined to go away, and did, was one where we were unable to get into true business conversations about return on investment and business strategy. We did some great technical work and have plenty of other victories to tout, but we found that our employees shine when engaged with a client that is truly happy to have found us and pulls us right into their business thought process. so this was a new experience for me, and I found Clear Measure right in the middle of Doug Tatum’s No Man’s Land. This is where the company is too big to be small and too small to be big. We’d already established all the major functions of a business and had dedicated people for all positions, but we were geared up for our growth and adding managers. If you read the book, you’ll know exactly our current state, but I like it that it is recognized, and we are moving through it. Along with the regular challenges of investing in management and proper systems while balancing the “in the middle” revenue levels, we established a good-sized line of credit with our bank because the cost of payroll ever two weeks had gotten pretty staggering. And our larger client’s invoices were quite large, so we didn’t want our employees to ever worry about their paycheck. We have never had to use our line of credit so far, and I hope we never do, but I sleep better at night knowing that we could go several payrolls even if 100% of our clients all decided to stop paying us all at once. Cash is king in any business, and all risks have to be managed. Speaking of risk, we almost moved through a time where some current employees incorporated a competing software development company while on payroll at Clear Measure. They operated on other projects for several months using company computers before we discovered it. That was a very big blow to us because the guys were well-liked, and I still don’t know why they did it, but we lost a couple of months fighting for the company. We were able to resolve it, and now we are stronger than ever. We just recently completely Q2 planning, and the event I’m most excited about is that we have leaders in every area of the company. Our folks have heard me say “it’s not the Mark and Jeffrey show anymore”. It’s true. While at the beginning we had to make all the decisions, it is not like that anymore. In fact, most of my decisions consist of deciding who else in the company should be making said decision. We did a bit of a pendulum swing, but we have a clear identity for the future. Our focus on making executives and business owners successful with their custom systems is still there. We still focus on return on investment, but we have grown to be a full-service firm around a custom software system that is used to run a significant portion of a company. Our best clients are mid-market firms who have a custom system already and want to invest for the future. It could be that the system needs to be upgraded, or it may need to be fixed in some manner. Or the system may need to grow so the client can offer more capabilities to its customers. Most of our clients are services firms themselves, and the better they operate on a daily basis, the better off they and their customers are. Our first year “we are a software engineering department” idea didn’t stick completely, but 80% of it has remained. As we have grown and the size of client we serve has grown, we tend not to be the entire department because they already have something established. But in the cases where they are happy they found us, and they have a place for us in the long term, we are pulled into business conversations, analyze their own ROI, and we integrate with their company and because a very valuable team with a clear responsibility tied to strategic business outcomes. We still organize according to the Surgical Team concept, and our teams are more like SWAT teams than Armies. Where others would mobilize a 10-person team, we’d do 4. We have found we excel when we have a business objective to accomplish. I have personally learned a lot in this journey, and there is much more to learn. But I am excited that this year’s challenges will be met by a whole group of leaders pushing forward with me in full support of them as their biggest cheerleader. With Windows 10, Microsoft continues it’s edition of Windows that sheds all of its Win32/16 baggage from 1985 on. In fact, on November 20th of this year was the 30th birthday of the original Windows. Wayne Williams wrote an interesting piece about Windows’ beginnings here. We first saw a glimpse of what Windows IoT would be with WindowsRT. I still have one of the first Surface tablets that ran WindowsRT, and the big difference was that while it was Windows, it didn’t have anything that required a Win32 API – or at least the ones that couldn’t be recompiled for ARM processors. Windows IoT continues with that and only includes newer APIs that don’t have the historical baggage tying it to the Intel x86 family of processor architectures. I decided to give Windows IoT a try. I didn’t set out with this explicit goal in mind, but I had been teaching my son and oldest daughter to program, and they also enjoyed Snap Circuits electronics kits. My guess is that while I entered computer programming and the Internet age in 1995 at the right time, their generation will be at the front of the robotics age. Not interesting robots, but the Internet of Things robots – small computers that have sensors and motors and do something interesting to enable a very interesting and useful business system for one of our clients at Clear Measure. This will combine programming skills, physics, math, and probably some chemistry. Perhaps a mix of electrical engineer, mechanical engineer, and software engineer will be in demand. Either way, it’s also fun to do these things with my kids. So I researched a programmable mini-computer that could connect to things and make things do things, and a stumbled across what I’d been researching for work as well – Windows IoT Core. IoT edition. I chose the Raspberry Pi because I’d researched it before, and it’s probably the most popular – at least it appears that way. I also just read about the Raspberry Pi Zero, that costs $5.00 and is super small. I ordered this AdaFruit Windows IoT Raspberry Pi kit from Amazon, and it came in today. After bribing my daughter to do some chores, we set out together to put it together and see what it could do. After the obligatory Blinky sample (blinking LED), we set out to do something more interesting, and we found the BrightOrNot sample. This combined the photocell sensor with a microcontroller, two potentiometers (voltage dials), and the Windows speed synthesizer, which I was surprised was included in Windows IoT Core (an API that can make the computer talk!). We put it together, wrote the necessary C# code, deployed from Visual Studio to the Raspberry Pi over the Wi-Fi network and ran it. Worked like a charm. I’ve recorded a video showing it in action. Austin, TX is a hot-bed for technology. You can find a user group for just about any technology and purpose meeting almost any day of the week. The long term vision is to create a sustainable community of professionals, educators, parents, and students that continually gives back to local community organizations through computers and technology while continually pulling the next generation of students into computer programming. It all starts with some volunteers to teach students the basics of computer programming. In the 1990s, the web changed the world. Now, we have hand-held smartphones and other devices (TVs, bathroom scales, etc) that are connected to computer systems via the internet. In the next decade, almost every machine will be connected to computer systems, and robotics will be a merging between mechanical engineering and computer science. Those who know how to write computer code will have a big advantage in the workforce where the divide between those who build/create and those who service what is created might get bigger than it already has. Code the Town will focus on introducing students to computer programming and then pull them together with their parents, their teachers, and willing community professionals to work on real software projects for local non-profits. In this fashion, everyone gets something. Everyone gives something, and everyone benefits. 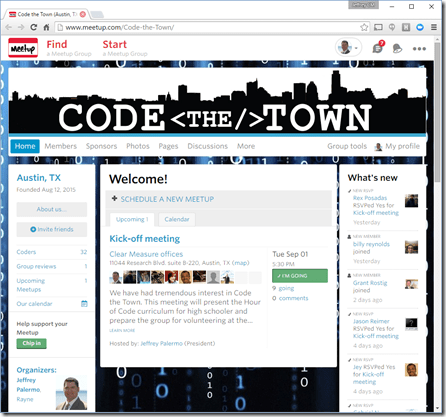 If you are interested in this vision, please come to the first meeting of Code the Town by signing up for the Meetup group. When preparing for my master developer boot camp class I’m teaching next week for a client, my Visual Studio 2013 installation started crashing on startup. This had happened to me before, and I reinstalled VS to get it working again. After some googling here and here, I uninstalled GitExtensions. Now my VS is working again. There is some commentary on the offending configuration, but at this point in my career I have a very low tolerance for buggy software – especially bugs that render the computer unusable – and for programmers, the IDE _is_ the computer. My IDE is working fine again, and I’m once again sticking with Atlassian SourceTree for most tasks and TortoiseGit when I just need that right click convenience. I remember computer science class at Texas A&M University where I was learning Java as a write-once-run-anywhere language. Back in early 2013, I predicted that Microsoft would start licensing Windows Azure to private data centers. As a software company, Microsoft’s strength is in software and software platforms. It has been dogfooding Azure to prove it out, but Microsoft never wanted to transform itself into a data center infrastructure company. Just as Windows Server is a computer operating system, Windows Azure is a data center operating system. Now, Microsoft has officially announced that for the past 18 months, it has been working on Microsoft Cloud Platform System (I predict the name will change because nobody licenses something that gets confused with “Child Protective Services”, CPS). This is essentially a cabinet-sized computer you can buy that has all Dell hardware pre built to run a 2000-VM capacity Windows Azure. I had no idea what their actual plans were at the time, but I’m glad they are doing this because now data centers all around the world can start hosting for their customers on a consistent Microsoft data center operating system. Now, Azure and OpenStack are the two cloud platforms to choose from for private data centers. I am really excited about this because at Clear Measure, we have already built a strong competency in Windows Azure not only on the software engineering side, led by James Shaw, but also with our DevOps division, led by Paul Drew. And with Andrew Siemer, former chief architect of Dell.com, we are also facilitating AzureAustin, a user group focused on Windows Azure from a software engineering standpoint. Eric Coffman and I paired this morning to tie off a great new feature that Eric had implemented. It is the concept of everytime scripts – scripts that are considered version-controlled (sprocs, functions, views, etc). These scripts needs to have a canonical version in source control but need to be re-run in an environment when changed. IterationZero projected updated so that you can see the proper use case. As many of you know, I went back to school 2011-2012 at the Jack Welch Management Institute and earned my MBA. My entire career has been writing business software, and now I’ve layered on business education to help me make that business software have even greater of an impact. JWMI, my master’s alma matre, is visiting Austin to give a seminar. Here’s the invitation. Please contact me if you’d like to come. Invitation is open to all. We invite you to join us on August 28th for a special community leadership breakfast event hosted by the Jack Welch Management Institute at Strayer University. As one of the most respected and celebrated CEOs of all time, Jack Welch transformed GE into the world’s most admired and successful company with his innovative management techniques. He continues to impact the business world as a bestselling author, speaker, commentator and advisor to many of today’s top organizations. By attending this complimentary event you will learn Jack Welch’s 8 Leadership Lessons to Live By, have the chance to win a signed copy of Jack’s book Winning, and network with other business professionals from the Austin area. Don’t miss this opportunity to learn actionable guiding principles that will help you win in life and at work.